Why choose Art Maison with natural cave pools at Oia Santorini? 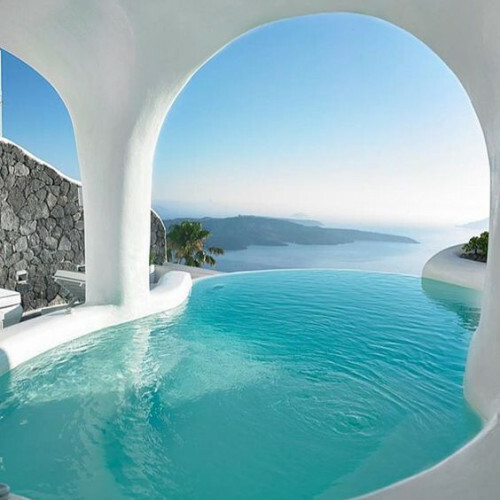 The Mediterranean’s most inviting island just got a whole lot better with Art Maison with natural cave pools - amazing boutique hotel suites on the Greek island of Santorini. There’s a reason that the most famous Greek island sends romantic Summer Lovers giddy with delight - the white buildings, the azure blue-domed roofs that sit atop the famous cliffs and the ancient volcano’s caldera are subject of a million lovers’ perfect photographs… Santorini is without a doubt one of the most idyllic places on earth. But what if we added Honeymoon Suites with natural cave pools and artistic interior design? Luxury suites with cosy balconies and heated infinity pools with direct views over one of the world's most famous sunsets? Art Maison is Greek for perfection. Perched high on the volcanic island of Santorini, in the midst of the most famous traditional village stands the legendary Castle of Oia. Once used as a fortress, the castle’s Luxury Suites blend seamlessly into the Santorini (or Thira, to give it its real name) landscape capturing the distinctive ambience of Oia allowing you to sit back and relax, maybe even in your king-sized jacuzzi. 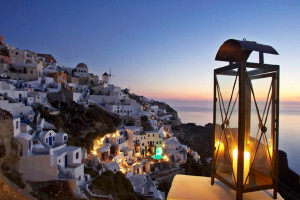 A glass of white wine in one hand, your sweetheart’s in the other, all you have to do is marvel as the Santorini sunset turns the baby blue sky and aquamarine Aegean Sea to midnight blue and the famous houses to a warm glowing orange before you tuck into some of that delicious Greek grub! Might this be the most romantic place in the world? Trip Adviser seems to think so as they gave Art Maison a 2017 Travellers Choice Award.